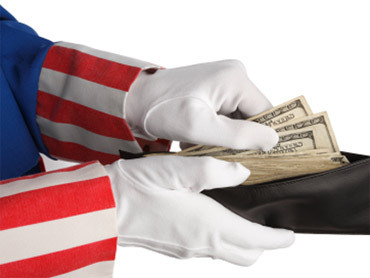 To the list of economic woes squeezing small banks, add another one: government bailouts. The Treasury Department's bailout program was designed with Wall Street megabanks in mind, according to a new report from a congressional watchdog. The "one-size-fits-all" program may actually be hurting small banks that are struggling to repay the money or even deliver quarterly dividend payments, the report says. The main bank bailout program anticipated banks springing back from the crisis and raising fresh funds to repay the government, the report says. That's exactly what happened to most of the big banks that took the most bailout money. Yet small banks continue to struggle, dragged down by souring loans for commercial real estate and high unemployment. Hundreds more small banks are expected to fail by the end of next year. The 690 small banks that took bailout money are even worse off, according to a report Wednesday from the Congressional Oversight Panel, which monitors the $700 billion financial bailout. Already, one in seven has failed to pay a quarterly dividend due to Treasury. They can't afford the payments, which will nearly double in 2013. Treasury spokesman Mark Paustenbach disputed the findings, saying in a statement that the bailouts helped many of the banks "weather the storm and continue to extend credit in the economy." But the bailouts' costs are troubling because of small banks' crucial role in lending to small businesses and supporting economic recovery, said Elizabeth Warren, who chairs the panel. The program "was not intended as a bailout for Wall Street," said Warren, who also is a professor at Harvard Law School. "It was intended to support ... homeownership, retirement savings and banks across the country." Warren said the bailout bill, known as the Trouble Asset Relief Program, did stabilize the financial system. But she said that was only one of the program's goals. She said efforts to boost lending and support consumers have been less successful. "There is very little evidence to suggest that the (bailouts) led small banks to increase lending," the report says. In the end, that could mean that the biggest banks get even bigger, the report says. Dozens or hundreds of bailed-out banks could collapse or consolidate because they can't afford their obligations to taxpayers, it says. That would leave the handful of biggest banks with an even larger share of the banking system. "The result could be that 'too big to fail' banks grow even bigger," Warren said. The Congressional Oversight Panel was created by Congress to report on whether the bailouts are meeting their goals. The law also requires regular audits by the Government Accountability Office and creates a special inspector general to investigate fraud and other problems.